We’re bringing it back! 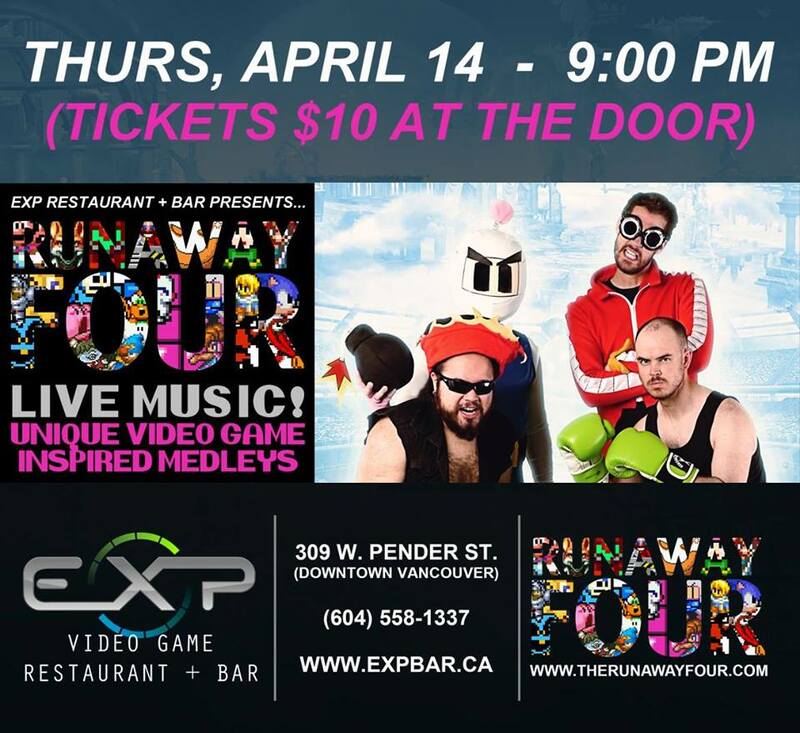 Vancouver’s video-game community celebration returns this summer with Bonus Stage 2, this year at the Fox Cabaret. Geeks vs Nerds Vancouver debate Yoshi vs. Chocobo, The Fictionals bring their Minus World Improv to the Bonus Stage for the first time, and expect return performances by MissingNo. and yours truly, The Runaway Four. Burlesque, prizes and a costume contest are all in the mix. Check out the details on the ol’ timey facebook! I can’t believe that just happened. What a crazy day. Getting there at 7am, setting up the gaming tables, TVs and consoles, then the tech and bands… a personal thank you from me, Josh, to everyone who helped out and participated. The schedule in the theater went really smoothly and I was able to escape occasionally to actually enjoy the Expo. That vendor hall was incredible! What a sprawl of games and gamer goodies. There was so much to take in. Thanks to all who showed up for our two sets at the end of the day. That was long and we were amazed to see the free games go mostly unattended during our performance. We had so much fun. If you wondered about that lengthy set list, you can check it out here. Cool beans! What an awesome time we had playing at EXP. Their licensing has eased up so they’re able to have live music now! Looks like they’re trying to start a monthly trend, and if you haven’t been it’s one of the best gaming atmospheres in town with the most delicious food. Thanks to everyone who cheered on our two, 45-minute sets. We had a real blast and now we’re looking forward to VanRetro. Come see us play another two sets of more new material! Are we crazy? Yes. 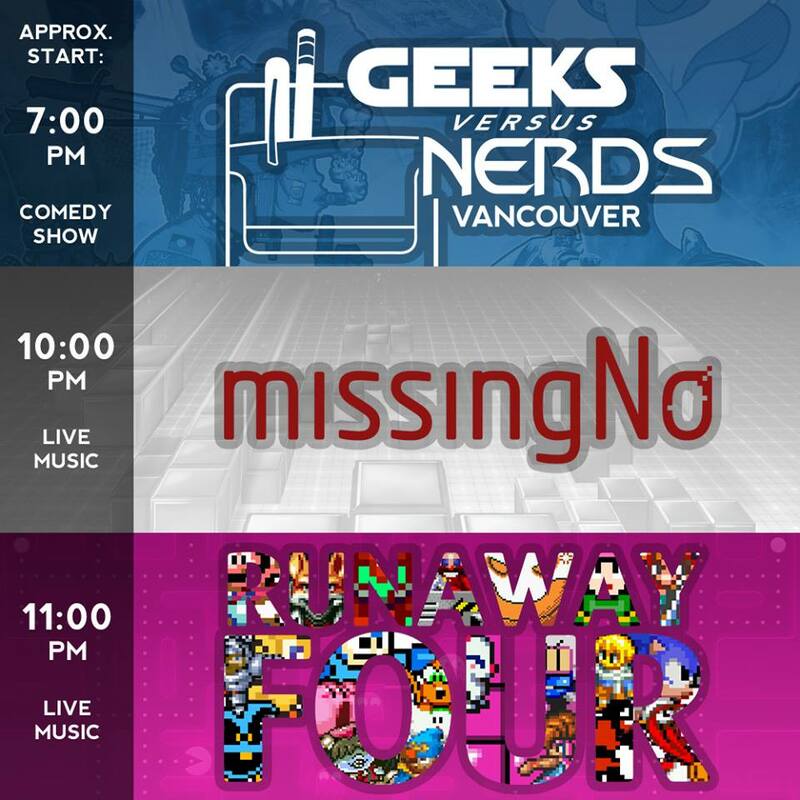 Oh wow, we played a show with Geeks vs. Nerds Vancouver and missingNo. That was fun! We tried going acoustic and selecting our set list was actually a challenge. We’ll have live footage available soon, if anything turned out! TYRAN CASTLE! DEVIL’S LAB! WEAPONS FACTORY! So many personal favourites in a row, and it’s so heavy. Enjoy. We’ve been asked to play Feb 27th at the Seven Dining Lounge! We’ll be playing our first ever acoustic set alongside missingNo. 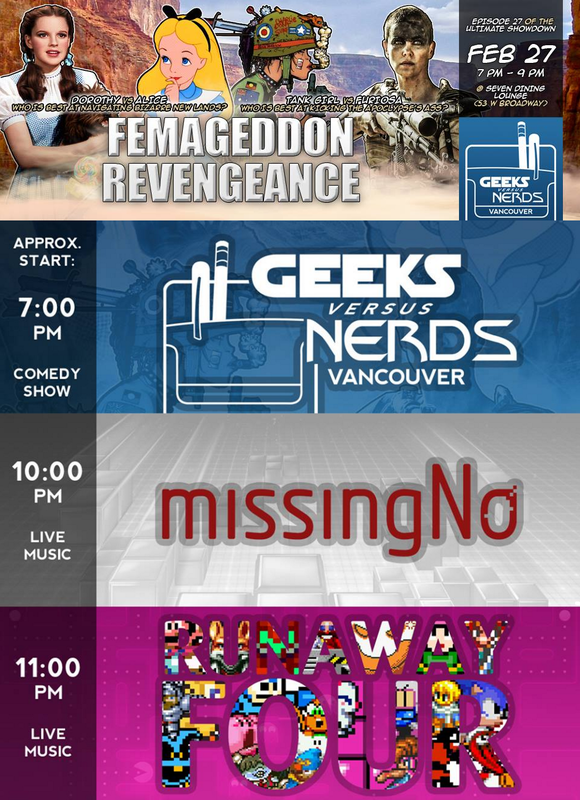 after Geeks vs. Nerds Vancouver host their Femageddon debate. Check out the event link for more info. It’s Thursday, and that means more Nerd Fest footage. We apologize for the men standing beside the camera talking over FF7’s battle music. If you wanted clear sound, you should have been there!